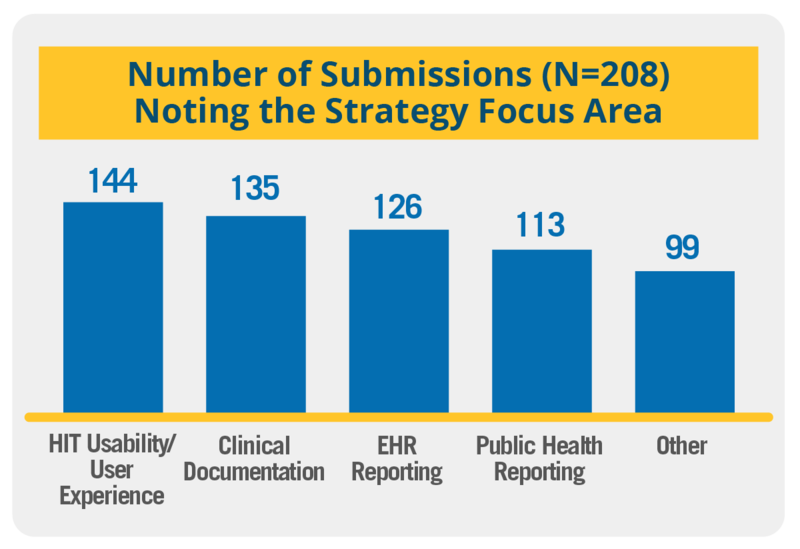 ONC received 208 comments on the draft Strategy on Reducing Regulatory and Administrative Burden Relating to the Use of Health IT and EHRs during the public commenting period. The draft strategy focused on 4 areas: clinical documentation, health IT usability and the user experience, EHR reporting, and public health reporting. Many stakeholders commented on more than one focus area in their submissions, with the majority of submissions commenting on health IT usability and the user experience. As intended by the comment process, comments were submitted by a wide range of stakeholders including: Health professional societies, providers of health services, health information technology developers, hospitals, public health entities, health care payers, health care quality organizations, state entities, health care suppliers of services, health care accreditation organizations, and patient advocates. Several stakeholders self-identified as "Other" and encompass a wide variety stakeholders. For those wishing to review comments submitted relating to this report, please reference the below chart. This chart may be sorted using the dropdown by report section.